Rabat---The war in Iraq was a deliberate intent and had nothing to do with the war on terrorism, said on Monday in Rabat Louis Cantori, US researcher and political science professor at the University of Maryland. “By deciding to invade Iraq the next day after the terrorist attacks on the World Trade Center and the Pentagon, the US administration who tried to establish a link between the attacks and the Iraqi regime failed its mission and deviated from the real objective,” explained Cantori in a round table on US foreign policy in the Middle East, organized by the US embassy in Rabat. 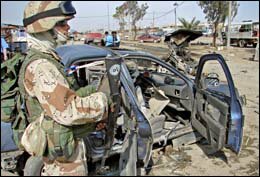 Cantori stressed that only after the US invasion of Iraq that this war-torn country became a fertile ground for terrorists, indicating that there are several books which support the theory that the decision to send US troops to Iraq was taken before the al-Qaida attack on American soil. He added that the American public mentality was so traumatized by 9/11 that the public is not able to see the whole picture of their government foreign policy. In the same vein, Matthew Anthony Evangelista, professor of Government and Director of peace studies at Cornell University, discussed the role of born-again Christians in the US foreign policy. Talking about the influence of Christian fundamentalists, Evangelista explained how they were mobilized to elect George Bush for his second mandate, noting that the US president identifies himself as a born-again Christian. “For the first time around 4 million Christian fundamentalists voted for Bush for his second mandate in 2004,” said Evangelista. He also highlighted their role in preparing the public opinion to attack Iraq, noting that their campaign started in the 90's on the morrow of the Golf War. A 2002 poll indicated that 69% of conservative Christians favored military action against Iraq, against only 10% below the average of Jews. A high percentage (80%) of members of the Republican Party favored the war in Iraq. “The poll indicated that Americans are more politically driven than religiously,” said Evangelista. The US researcher said that these Evangelical Christians who are composed of two groups, Christian Reconstructionists, and believers in the Dominian theory, have financial resources, their own radio and TV stations through which they promote their ideas. “Their main interest is in domestic issues not in foreign policy. They would like to replace the US system based on the constitution and the separation of the church from the state to their own literal reading of the bible, resembling the one that governed ancient Israel,” said Evangelista. He added that among heir goals are to make abortion illegal, allow Christian school prayers and religious symbols in public places. Evangelista concluded that only a minority of Americans supports their ideas, but still they are influential. Both speakers put reference to the US handling of the Palestinian-Israeli conflict referring to the government's double standards in this issue. Participants in the round table agreed that it is up to congressmen to lessen the occurrence of terrorism by knowing the real motives behind it. This, stressed the participants, won't be done until the United States review its foreign policy in the Middle East and avoid double standards.